This collection of 50 beloved Christmas songs has been crafted to provide professional-sounding, easily prepared arrangements for busy pianists. Each arrangement has been carefully engraved for easy reading, and approximate performance times have been included to assist with planning set lists. Perfect for holiday parties, light concerts, or other festive gatherings, these piano solos will provide a valuable resource of crowd-pleasing favorites. Titles: Angels We Have Heard on High * Auld Lang Syne * Away in a Manger * Believe (from The Polar Express) * The Christmas Waltz * Deck the Halls * The First Noel * Frosty the Snowman * Gesu Bambino (The Infant Jesus) * The Gift * Go, Tell It on the Mountain * God Rest Ye Merry, Gentlemen * Good King Wenceslas * Grown-Up Christmas List * Hark! The Herald Angels Sing * Have Yourself a Merry Little Christmas * A Holly Jolly Christmas * (There's No Place Like) Home for the Holidays * I Heard the Bells on Christmas Day * I'll Be Home for Christmas * It Came Upon the Midnight Clear * It's the Most Wonderful Time of the Year * Jingle Bell Rock * Jingle Bells * Jolly Old Saint Nicholas * Joy to the World * Let It Snow! Let It Snow! Let It Snow! * Let There Be Peace on Earth * Mary, Did You Know? * O Christmas Tree (O Tannenbaum) * O Come, All Ye Faithful * O Come, O Come Emmanuel * O Holy Night * O Little Town of Bethlehem * Rockin' Around the Christmas Tree * Rudolph, the Red-Nosed Reindeer * Santa Baby * Santa Claus Is Comin' to Town * Sending You a Little Christmas * Silent Night * Sleigh Ride * There Is No Christmas Like a Home Christmas * Toyland * Ukrainian Bell Carol * Up on the Housetop * We Three Kings of Orient Are * We Wish You a Merry Christmas * What Child Is This? * When Christmas Comes to Town (from The Polar Express) * Winter Wonderland. 136 pages. take long to master. This is an intermediate level piano collection. I would recommend them to any intermediate level pianist looking for some different arrangements of familiar Christmas carols. it isn't my first choice is that I have very small hands, and quite a few of the arrangements have a lot of large chords, octaves, and are just generally uncomfortable to play for someone with very small hands. Wonderful book. 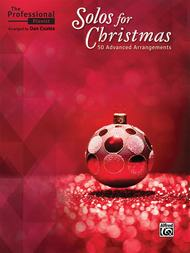 Lots of variety in pieces and the arrangements are challenging, doable, and very nice sounding. December 08, 2018 Great for gigs! ; it's a lot more fun than sightreading classical music as well. There are some more advanced pieces in here as well, but even they can be simplified as you play through them. To panacea0009- I take music books like this to a local print shop. They can cut the binding and place a spiral binder quite easily. Inexpensive $4-5. Fedex stores do this also. But costs more. This is a wonderful book.